Imagine peering into the underwater channels of prehistoric rivers and trying to visualize the lives of people who lived alongside them when they were above sea level. One year ago, attendees of a scientific meeting convened by the Royal Society of London were able to do just that, thanks to a project completed by the Aucilla Research Institute, based in Monticello, Florida. The project mapped the submerged channels of the Aucilla and Econfina Rivers five miles off the Florida shore in the Gulf of Mexico. Scientists affiliated with the Royal Society of London organized “Lost and Future Worlds: Marine Paleolandscapes and the Historic Impact of Long-Term Climate Change” to identify new tools to explore landscapes that were above sea level during the last ice age. The conference was held last May at London’s Chicheley Hall. Founded four years ago, the Aucilla Research Institute (ARI) supports original research in the archaeology of the Jefferson County-northwest Florida area. Dr. Jessica Cook Hale, then a doctoral student at University of Georgia, presented findings from maps created at the institute with data gathered using bathymetric LiDAR (light detection and ranging) technology. 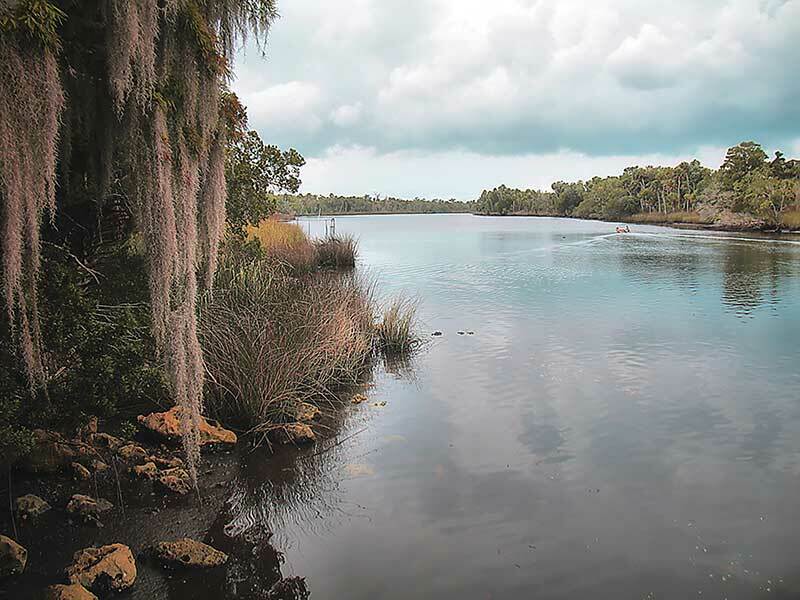 Institute board member Dr. George Cole, an adjunct professor of geography at Florida State University, used the LiDAR data to map features of the paleo-channels of the Aucilla and Econfina Rivers. Then as now, rivers and seas determined human habitation in North America, and these channels represent the early routes of the rivers heading to sea, Dr. Cole said. Native Americans settled on the lands mapped by the project when, 12,000 years ago, Florida’s shoreline extended 75 to 80 miles out into the Gulf of Mexico. Typically mounted on aircraft, LiDAR measures elevation or depth by analyzing the reflection of pulses of laser light off an object. While LiDAR has existed for several decades, red-spectrum lasers haven’t been able to penetrate the reflective surfaces of bodies of water. The development of green-spectrum lasers able to reach the sea floor has opened the door to collecting detailed nautical data. “You can literally gather thousands of points per second and create a high-density image,” Dr. Cole said. In November 2016, the Aucilla Research Institute commissioned a flight using a green-spectrum wavelength laser 400 meters above ground level. After local consultants tested the reliability of the sounding — a process poetically named “groundtruthing” — Dr. Cole and FSU graduate student Zachary Joanas created a large poster to visualize the methodology and results of the LiDAR findings from the Aucilla and Econfina River channels. The Institute commissioned a second flight in December 2017 over Wakulla Springs and the Wakulla River. Aerial LiDAR imaging shows ancient channels of the Aucilla (left) and Econfina rivers now submerged beneath the Gulf of Mexico. People once lived alongside those channels. Displayed next to the seminar room in Chicheley Hall, that poster created in Monticello was available to scientists from around the world who gathered in London to discuss their own projects to map underwater topographic features of interest to archaeologists. The presentation Dr. Cook Hale gave at the Royal Society joined others in the subfield of submerged prehistoric archeology, including other remote-sensing methods and extraction of DNA sequences from sediment cores. She noted that excavation sites have already been identified in Florida, in comparison to other places in the world that are only now developing models for finding sites where prehistoric people lived. “Bathymetric LiDAR is one of the most potentially productive methods for submerged landscape reconstruction to appear within the last 30 years,” said Dr. Cook Hale. “It should allow us to narrow our focus when searching for, excavating, and interpreting these sites in ways that would have been impossibly expensive and time-consuming before. “We highlighted the construction of bathymetric maps from the LiDAR, and from very preliminary results from our dives in February 2017, two targets identified as potentially archaeological within those maps,” she continued. Dr. Cole’s report identifies for further study a mound along the Econfina Channel that is “very close” to a Native American shell midden, a pile of the shell and bone remains of prehistoric dinners. In a separate project, Dr. Cook Hale’s research suggested that areas surrounding the midden had hosted human settlements for a span of more than 1,200 years. A second area for study includes a submerged man-made object rising to about 4 feet below water level, which Dr. Cole’s report suggests is an uncharted derelict vessel. Dr. George Cole takes readings to assess the precision of the LiDAR elevations. Bathymetric LiDAR data will keep the Aucilla Research Institute busy in the coming year, according to Dr. Cole. Assuming the Florida Legislature passes it, ARI was approved for a grant to fund graduate students to analyze the existing data about the Aucilla and Econfina channels, with instructions to identify potential research sites and to take core samples of those targets. “We think we know what the promising sites are but we’ve got to dive out there to check them out,” said David Ward, Institute board member and co-author of the Aucilla and Econfina mapping project. Based on a number of other archeological finds along the Aucilla and Econfina Rivers dating back thousands of years, including the famous Page-Ladsen site, Dr. Cole expects to find evidence of human occupation. The Florida Legislature has already approved a large grant to map Wakulla Springs, Dr. Cole said. He also hopes to create more maps that extend further into the Gulf of Mexico using LiDAR.